I finally finished with the 6 Square3 cards. Not posting all of them because some of them are like the ones I already have done. BUT......this one I really like! I used raffia! *okie thinks to self....ye ah okie they can see that it is raffia* I did punch holes and set eyelets for the raffia to got through. I think it just adds the perfect dimension for fall! I stamped the pumpkin on the off-white square and then stamped another one and used foam mounting squares to add it over the one on the square. The tree is a Marvy punch and it is also on foam mounting material. The stamps are from the Studio G series 20 set. The fall ones were the only ones in that series I really liked and thanks to Grits4ever I am having a blast with them!! This card is wit h the cuttlebug A2 folder Autumn Blessings.....or Autumn words.....can't remember LOL. I used stickles and ink on the card. I got the leaves at Wal-Mart a few weeks ago. They were $1.00 for a package of 80, GREAT PRICE!! I did some brown ink on the leaves to give them a more weathered effect. And yes........STICKLES! *okie grins and nods head* I know you guys are surprised to see Stickles! HA! 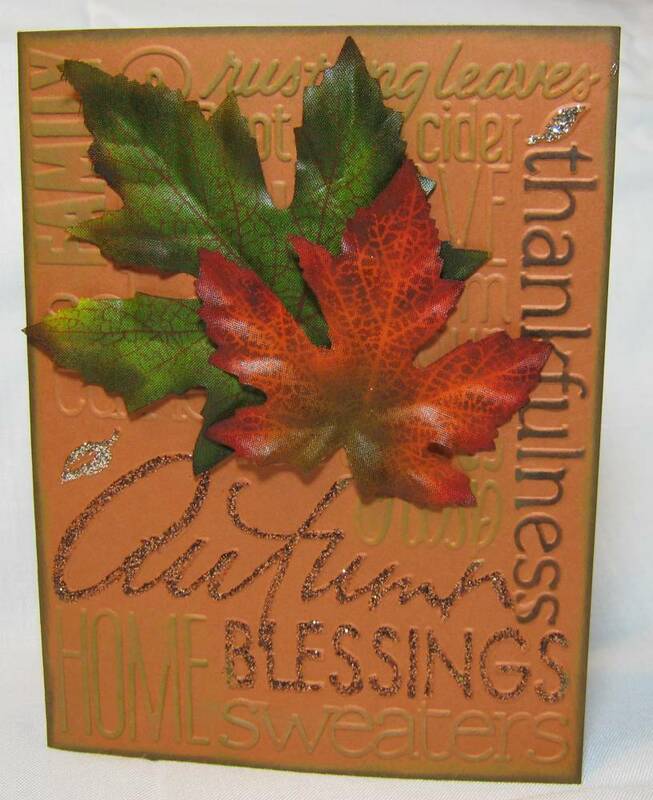 Okay my friend Scrappinbee just informed me the folder is called "Autumn Embossing Folder". Thanks Bee!! *wonders if everyone knows what the Bee really stands for.......okie now thinks that Bee is gonna wanna whoop okie if she reads this* I don't like the platinum stickles on the embossed leaves in the picture.....but in person they do look better!! I PROMISE!! wow i love these cards !! 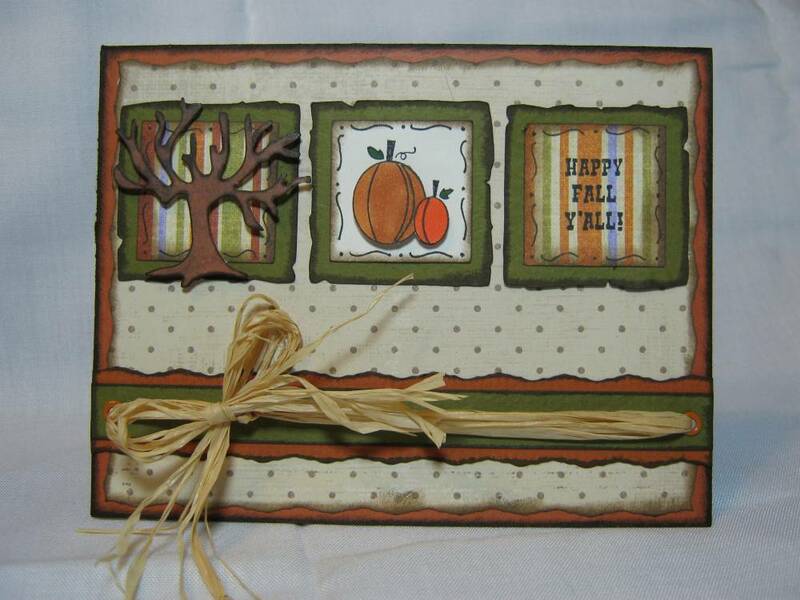 those leaves look awesome and that raffia is perfect touch for a fall card !! clever clogs !! Man... I love the top card!!.. that is great.. I need to use my stuff... and get back to doing somethings..
thanks for sharing the files for the halloween pocket card! your work is awesome! Lovely cards. It may be too old to matter at this point, but just in case you want to know, the Cuttlebug embossing folder used on the second card is really called "Autumn Type".